Rawether driver uses almost exactly the same code with just a small difference. WinPcap calls bpf_validate() function when someone sets the packet filter program and it forbids to set malformed filters. Validation routine performs standard memory load/store checks and simple control flow checks to avoid endless loops and jumping outside of the BPF filter. During filtering stage, BPF program is executed without those checks, since it relies on the one-time validation which was performed earlier. Rawether driver doesn’t perform this validation, thus it is possible to write BPF program that will read/write arbitrary memory (or just endlessly loop, but it is not really interesting). Read/write address is relative to the current stack position – internal memory that can be accessed from the BPF program is just local array of ints. On x86 platform it is possible to access full 32bit memory address range. On x64, exploit can reliably access only the stack memory, which is sufficient to build working ROP chain. Since BPF program allows write to any stack location, it is very easy to overwrite return address without even touching stack canary (which btw this function doesn’t use). 0x12 is the size of the stack frame (divided by 4, because the local memory is represented as an array of ints), so writeStack() can be used to overwrite bpf_filter() return address and all stack frames which are above. // !!! spinlock acquistion here !!! To reset KSPIN_LOCK it is sufficient to set the spin lock value to zero. KSPIN_LOCK value is kept under [rsi + 0x38] during the whole bpf_filter() execution. In next steps I’m getting EPROCESS address of the process that will be elevated (PsLookupProcessByProcessId) and address of “NT AUTHORITY\SYSTEM” EPROCESS using PsGetCurrentProcess. bpf_filter() is called from NDIS_PROTOCOL_DRIVER_CHARACTERISTICS.ReceiveNetBufferListsHandler, from what I saw this handler is called from some NDIS helper thread, thus it has SYSTEM rights. 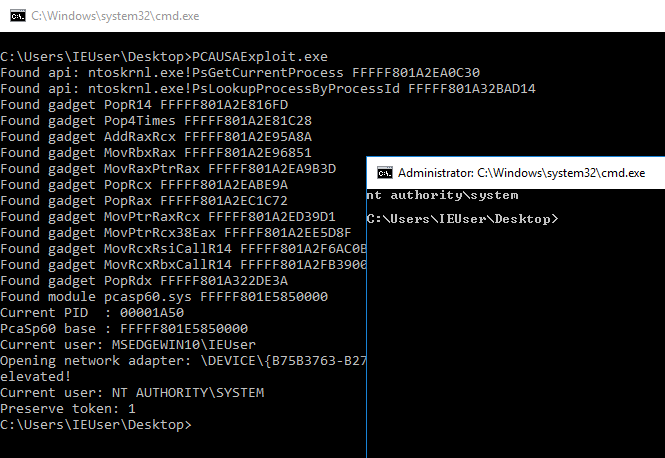 Later, ROP chain overwrites target process token with the token stolen from SYSTEM process and returns the execution to the epilogue of the ReceiveNetBufferListsHandler. Described method can be simplified, but I wrote this exploit before I finished GoGoGadget library and without properly doing the homework with regard to kernel information leaks. Having EPROCESS information leaks in place, calls to PsLookupProcessByProcessId and PsGetCurrentProcess can be skipped, and ROP can just use EPROCESS addresses gathered by ring3 part of the exploit. The last bytecode operation is “return 0” so the bpf_filter() function will set the eax register to 0 at the end of the BPF program. I’m using this value to reset spinlock at the begining of the ROP chain. To enable vulnerable part of the driver, exploit has to issue OID_GEN_CURRENT_PACKET_FILTER NDIS request with NDIS_PACKET_TYPE_ALL_LOCAL flags and set the BPF program. Exploit is triggered by reading the first received network packet. I want to use this so I can disable DSE to load an unsigned driver to bypass Battleye’s AC for pubg, but I can’t find that damn driver! I would use the public VBox exploit, but everyone is saying it’s detected & to go find a new vulnerable driver. Do you still have it laying around? I’m pretty sure you will find it somewhere around, there is tons of those drivers. I’m sorry to hear that, this is really sad news.